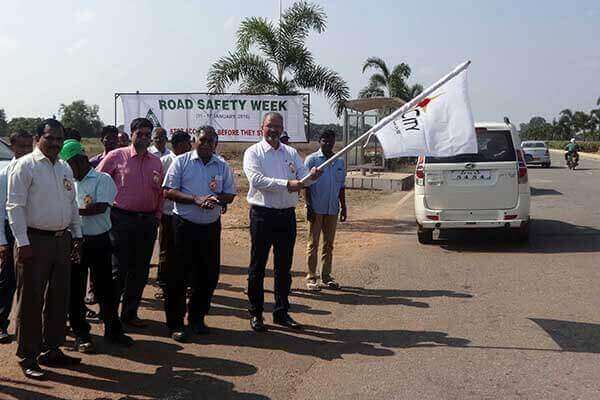 Sri City, January 11, 2016:- Along with the rest of the country, the 27th Road Safety Week got under way in Sri City. Mr. Satish Kamath, President (Works) inaugurated the ‘safety week’ programme organised by the Safety division of Sri City, this morning. Addressing the gathering Mr.Satish stressed the need for adherence to all road safety rules and norms on the part of the vehicle drivers and the road users for checking the disturbing trend of mounting fatalities in road mishaps.He also said that the authorities needed to be stringent in curbing the menace of drink driving. Safety Week is, ‘Road Safety: Time for Action’. He told that road safety awareness talks and demos will be given throughout the week for educating the people in and around Sri City, particularly those using two wheelers. Badges portraying a road safety slogan were distributed to all for displaying prominently. Mr. Sk. Altaf, General Manager, Security & Vigilance, Mr. A. Sanyasi Rao, General Manager (Coordination) and a good number of employees of different industrial units at Sri City attended the inaugural ceremony.